"Fans attend a driver appearance before the NASCAR Sprint Cup Series Aaron's 499 at Talladega Superspeedway on May 4, 2014 in Talladega, Alabama." On the NASCAR circuit, one never knows what they might see at any given time. Sometimes the smaller, slower tracks surprise. Sometimes weather plays a factor with imagery. Sometimes there are crashes. Sometimes the races are clean. Yet the superspeedways always deliver. Let's be honest, fans and drivers alike, love to see wide-open throttle racing at 200mph. These fast-tracks draw large crowds - and those fans know how to have a good time near and afar from the track. 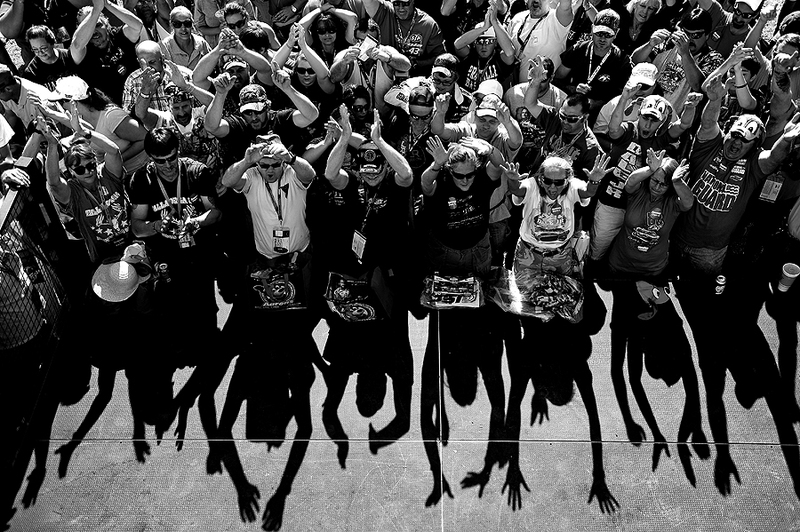 Returning to Talladega, I had the opportunity to roam the entire track for the Getty Images team. Normally we are positioned in one turn, but this time around I got opportunity to roam to see what I can find. While this is always exicting, it adds a bit of stress because, as mentioned above, you never know what you may or may not find. You have to manage your time wisely, and if the picture you're staking out doesn't work, you must move on. In the end, I walked more than I ever had at a race, yet was rewarded with unique take that helped bring a bit more fan features and diversity to the team's take. As I rest my feet, I think the next race I'll be just as happy to be camped out in a single turn, but always happy to do whatever is needed for the team, even if that means walking more than 10 miles.